Our guest Julia (from Russia, living in Turkey at that time and horse lover) brought up her wishes once she would come to Jordan. First she wanted to ride a horse around Petra. Second and since very long time on her bucket list, a visit to the Royal Stables. Third, sleeping in the Wadi Rum. We put everything together in an itinerary for her and a friend who would join. The Royal stables were the last on the list early morning before their flight back from Amman. The stables are situated in a beautiful suburb of Amman. 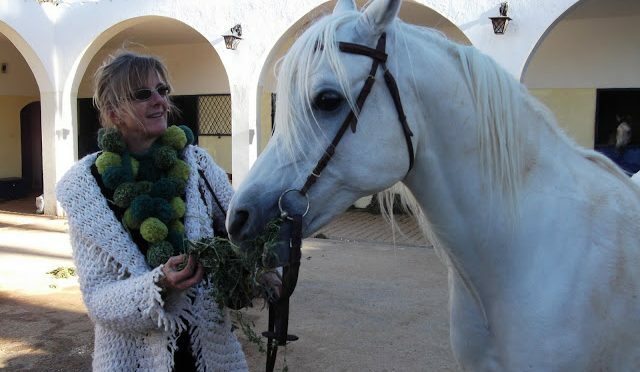 Once there we could visit all the horses freely and got a demonstration of the white stallion. We were so delighted to see all those beautiful horses. I was hypnosed by the blue eyes of some of the horses. Never seen this before. Everything in the stables was an example of how you can stable those beautiful noble creatures. Very clean and neat. The demonstration of some stallions in the paddock was breathtaking. HRH Princess Alia is the director of the Royal Stud and wrote the book Royal Heritage. HRH Princess Alia is the eldest daughter of the late King Hussein and Sharifa Dina, his first wife. Sister to the King of Jordan, Abdullah II bin al-Hussein. She wrote a book with Peter Upton: ” Royal Heritage“, the story of Jordan’s Arab horses, from the early days of the bedouin tribes to the 21st century, a story closely associated with the Hashemite family of Jordan, direct descendants of the Prophet. In 1987 Princess Alia, organised the first Arab horse show to be held in Arabia entitled ‘ The Arab Horse at Home’. It was an event which inspired other Arab countries to organise horse shows of their own. The story of the Princess Alia Foundation. Small Miracles is co-authored by HRH Princess Alia, and Sharifa Sarra Ghazi, Small Miracles, the Story of the Princess Alia Foundation is the account of an extraordinary charitable endeavour. When it was established in 2009, the authors little knew how the Foundation would fundamentally change their lives, as well as the lives of countless others – animal and human. In 2009 HRH Princess Alia founded the Princess Alia Foundation (PAF) to address issues relating to human and animal welfare and the environment. The Foundation follows a holistic approach and its message is ‘Compassion and Respect Towards All Creation’. Once I hope to meet HRH Princess Alia, for now I admire her already for her work with animals, their protection and educational programs. Next time more about my life with horses in Petra. If you like to know where I am now and what I do, visit our website Jordan Desert Journeys. or our facebook page JordanDesertJourneys. Or connect to me on facebook.